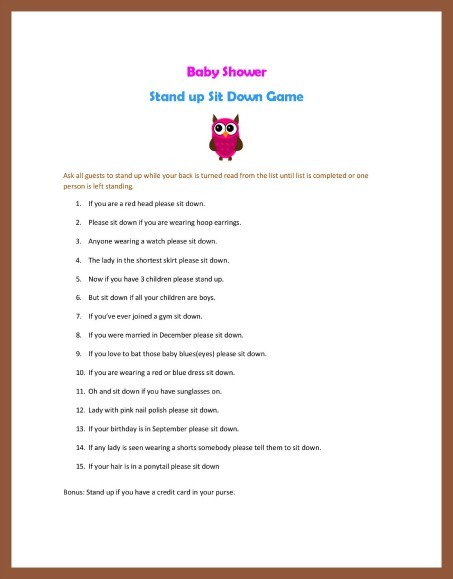 The baby shower stand up sit down game is a fun and easy elimination game that also allows guests to learn something about each other. You will need to have a group of five or more women. Yes I did say women because I think this activity is suited to a female audience. Not a problem though the women will enjoy listening and reacting to all the instructions. Prepare a list of commands beforehand. You can read directly from the list or cut out each statement and put in a basket so you can pick randomly. The rules are simple. Everyone will stand up and as you read each command they will sit down or stand up if a particular statement refers to them. The last person standing wins. However, if at the end of the list more than one person is standing then all those standing will sit down and you will read the bonus command and the first lady to stand wins. Make sure that when you are down to 2 commands you count one as the final one and the other as bonus or you will have to come up with a statement on the spot. You can make your own list by compiling some common traits since you will know the guest list before hand. For instance if you know some older women will be in attendance then you could say "if you have grand-children please sit down". You get the idea right? Don’t worry we compiled our very own Stand up sit down game for you to get some ideas. 1. If you are a red head please sit down. 2. Please sit down if you are wearing hoop earrings. 3. Anyone wearing a watch please sit down. 4. The lady in the shortest skirt please sit down. 5. Now if you have 3 children please stand up. 6. But sit down if all your children are boys. 7. If you’ve ever joined a gym sit down. 8. If you were married in December please sit down. 9. If you love to bat those baby blues(eyes) please sit down. 10. If you are wearing a red or blue dress sit down. 11. Oh and sit down if you have sunglasses on. 12. Lady with pink nail polish please sit down. 13. If your birthday is in September please sit down. 14. If any lady is seen wearing a shorts somebody please tell them to sit down. Bonus: Stand up if you have a credit card in your purse.